Lexus promotes its December to Remember Sales Event in a new commercial that is also an invitation for people to let their inner child loose this season with the Lexus they’ve wished for all year. The 30-second spot, titled “Whispers”, begins with a little girl who, seeing a white Lexus wrapped as a Christmas gift, drops the snowball she was holding and, followed by a black puppy, starts talking to the car. “I love you so much, we’re going to be best friends. We’re going to go everywhere together and see everything.” – she says excited while running around the car. “You know that GX is both of ours, right?” – a man asks. When the camera spans back to the girl, it is revealed that she is not actually a little girl, but a grown-up woman who just let her inner child express her joy. “Don’t listen to him.” – she whispers to the car in response to her partner’s question. 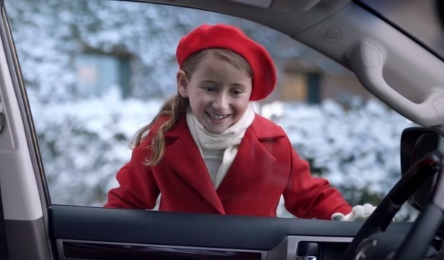 “Nothing brings out your inner child like the holidays.” – the voiceover says at the end of the commercial, urging viewers to “Experience the excitement of the Lexus December to Remember Sales Event” and adding the company’s tagline, “Experience the amazing”. The music playing in the background is the famous one-movement orchestral piece “Boléro” by the French composer Maurice Ravel.